This chapter, the authors analyze mobile learning literature addressing formal teaching situations in the field of science/mathematics education. The chapter describes a systematic review of relevant literature, investigating work published between 2005 and 2014. Based on the findings of this review, the results reveal that since 2009 interest in the academic community for research involving m-learning in science and mathematics teaching has intensified. An emphasis on the growing need for research involving m-learning at undergraduate levels is evident. 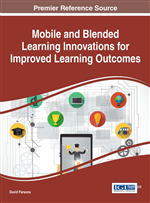 The study notes positive reported results on the impact of m-learning in science and mathematics teaching, notably in assisting ease of learning, promoting student interest and collaborating with positive, motivating attitudes, encouraging meaningful commitment among students in learning activities. Mobile devices have led to changes in numerous segments of society. Embedded in our daily life, they reshape the way we live; communicate, relate, work and play. The spectrum of possibilities provided by mobile technologies, including portability, free access to information, flexibility and exchange of information, among others, lead us to question how society appropriates/incorporates these new features and how this affects socio-political, economic and, especially, learning spheres. We must investigate specifically how these modern technological resources are inserted into teaching and learning subject study contents and specifically those related to Science and Mathematics. Studies like that of Chen (2009) point out that the teaching of Science and Mathematics is a continuous challenge to be overcome for many countries adopting many academic levels. Drew (2011) also points to the lack of interest demonstrated by university students in scientific and technological careers, even in those who did well in math and sciences during High School. In this context, this chapter seeks to examine how mobile devices are used in formal teaching situations in the field of tutoring science and mathematics. Cook (2009) presents three stages of research on mobile learning, the first of which focuses on the devices involved; with widespread experimentation in PDAs, tablets, laptops and mobile phones, accentuating the advantages and disadvantages of using these devices in studies. The second stage concentrates on learning proposals outside of the classroom, including field trips, visits to museums, etc. The third stage of the research focuses on student mobility. This chapter focuses on student mobility, design/appropriation of learning spaces and lifelong learning experience. Traxler (2009), while acknowledging progress thus far achieved, admits that this area still has far to go in technological as well as pedagogical terms. Mobile devices are mainly characterized by their mobility (wireless) and portability (small, lightweight devices) enabling the issuance, circulation and exchange of information during real time user movement.